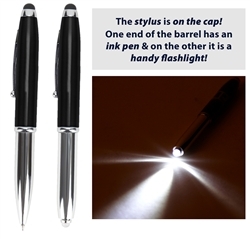 Great 3-in-1 Multi-tasker ballpoint quickly changes from function to function. The pull off cap has a stylus with advanced connectivity for all touch screen devices. The barrel of the pen has a bright, powerful, push-to-activate LED Flashlight that is easy to use on one end with black smooth writing ink on the other. Pack of 1 pen - individually cellophane wrapped.